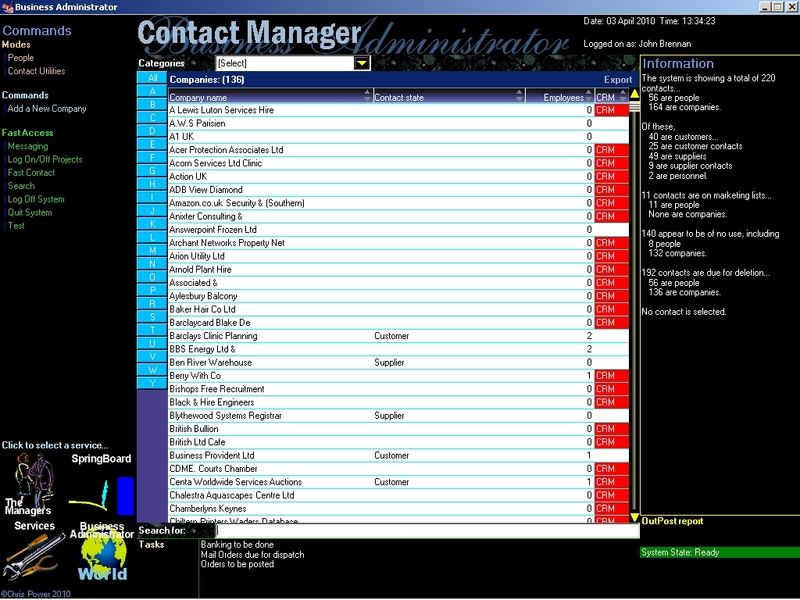 Business Administrator software is made for businesses. A powerful business workhorse, it helps businesses manage their whole environment from one easy to use system. It was designed to save time and money, but, over the years, it’s become so much more sophisticated. 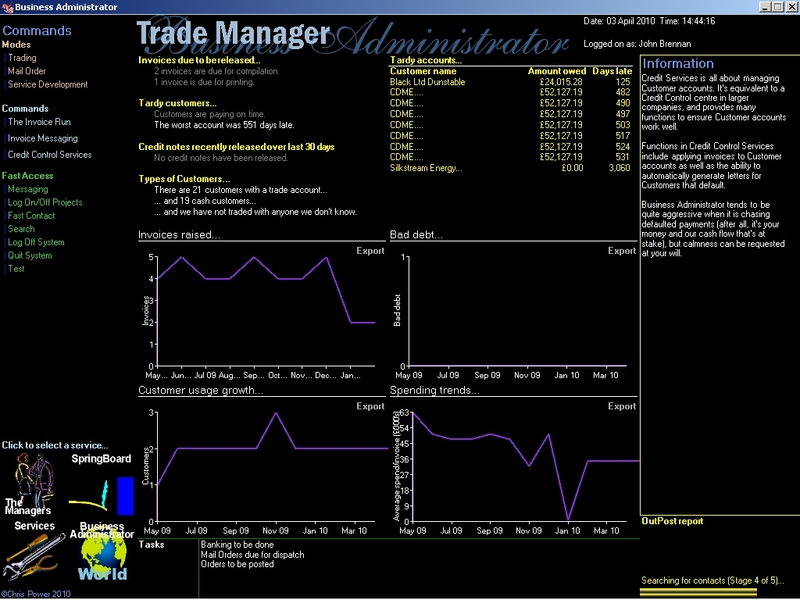 Business Administrator is a state-of-the-art business management and administration system. It has eight zones that work with the key areas of a business, all of which are totally integrated and work together to ensure you have a seamless experience. Each of those zones is laden with tools dedicated to making business life efficient. Business Administrator is a very active system. It’s not simply a database from which you print reports: it’s a system that is alive and spends its time trying to help you. 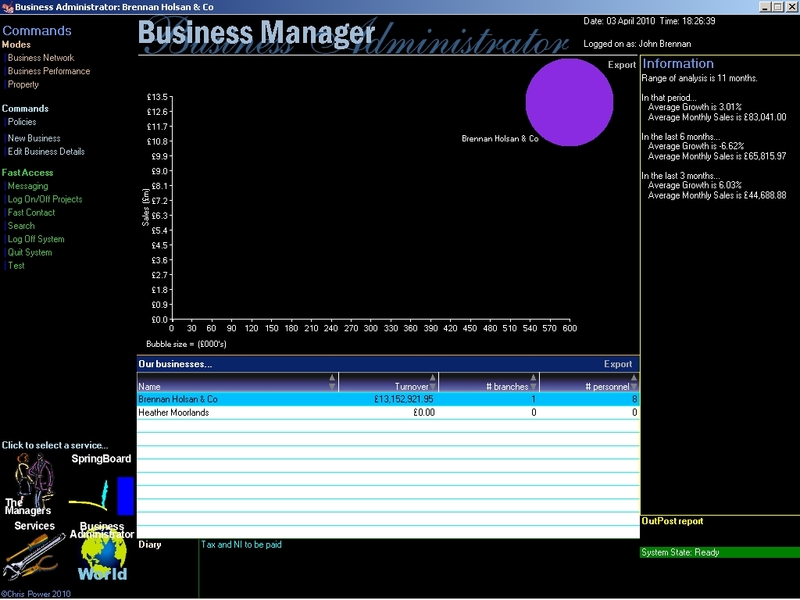 You will be able to see progress bars as Business Administrator constantly manages the middle office of your business. You can run invoices from it, you can manage your stock with it, you can set pricing controls, it has EPOS on board, payroll is there, live reports are available whenever you want to see them, you can project management business initiatives, and so on. 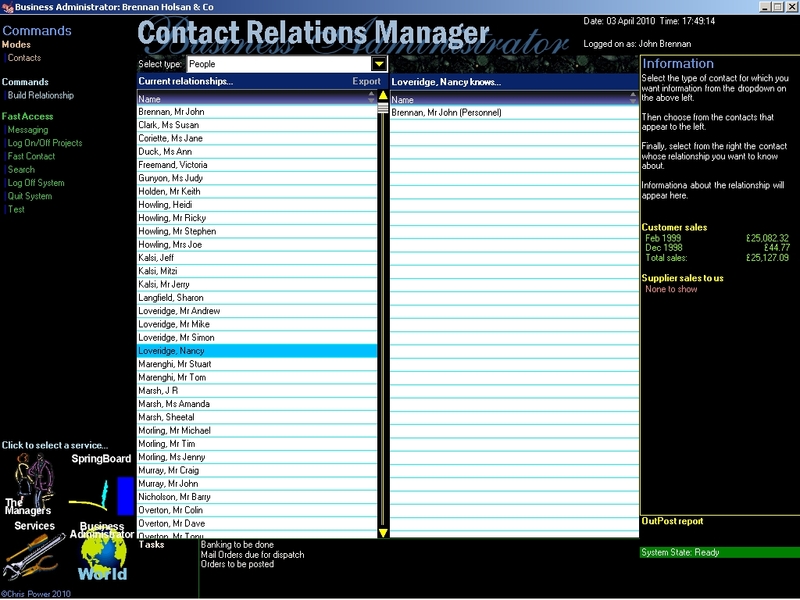 What’s really magical, is that it’s all linked in together on one single system, and works seamlessly. For the businesses that use Business Administrator, it ensures that users know everything they need to know about their business because it offers live reporting on all sorts of things, especially the performance of their business. It takes away the middle office, so there is no staying after work to do routine paperwork. And the back office is just a matter of printing out reports and sending them to your accountant, or whomever, when necessary. Put simply, you tell Business Administrator you have made a sale, and Business Administrator will be ready to produce a report. If you are a director of a larger business, you can watch what’s happening on the shop floor or front office because of live reporting, and from different perspectives. 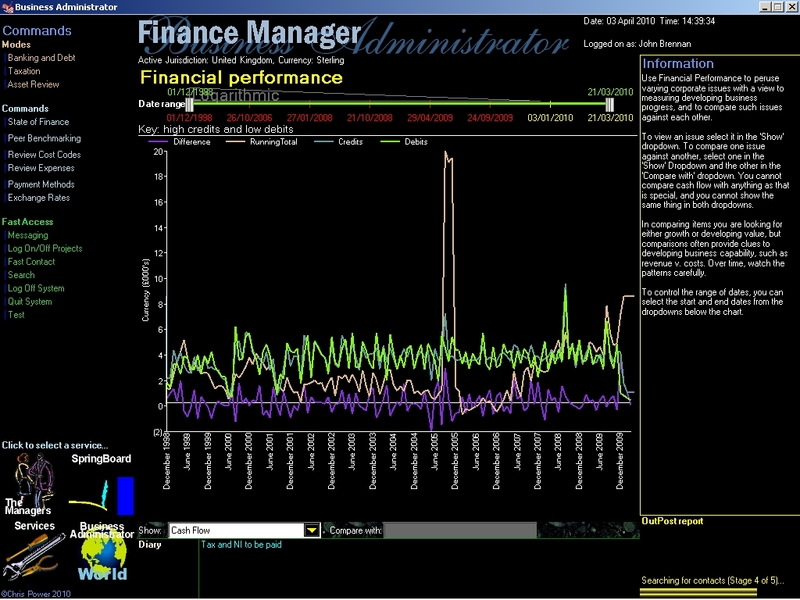 You can also watch where your business is heading, in real time, and make fast accurate decisions. Smaller businesses can gain the advantage by knowing exactly what their business is doing, and by being able to respond quickly to changing environments, and change accurately. Gathering reports take no time at all because reports are heavily business focused: they are the reports you need. Business Administrator was designed by a small growing business to its fulfil business needs, and the needs of other businesses that use it. You can now buy Business Administrator at Amazon on CDRom. Or you can get in touch with Chalestra and see if you can persuade them to offer you a deal, particularly if you’re buying a few licences. April 15, 2010 - Chalestra Ltd - Whatever the state of the economy, businesses must keep on top of their administrative tasks. SMEs, in particular, cry out for software that can make them truly efficient and well-informed, without breaking the bank. To help them handle everything from customer relationship management to finance and stock control, Chalestra’s 'Business Administrator' software, a popular and proven business management system, is being released in a faster and more powerful new version. First launched a decade ago, Business Administrator has gone from strength to strength within the SME sector. 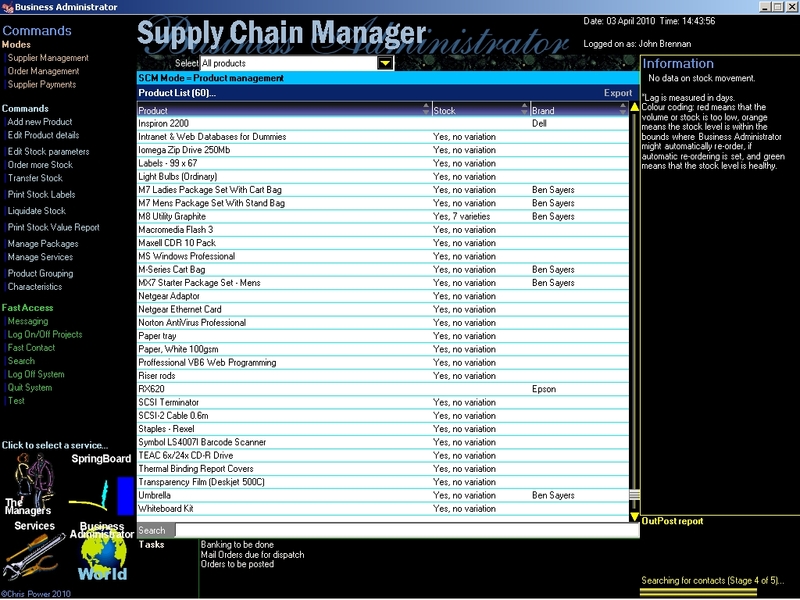 Most unusually, it is an all-in-one suite offering a customer relationship management system, financial administration package, stock control package, stock order package and much more, all fully integrated and sold at a single, low annual fee. 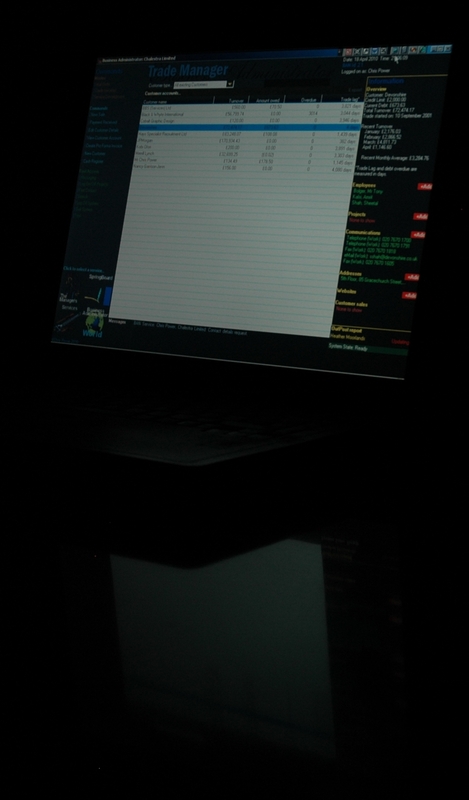 And Chalestra has been busy during the downturn, commissioning its developers to rebuild Business Administrator's engines, making it even more attractive to users. 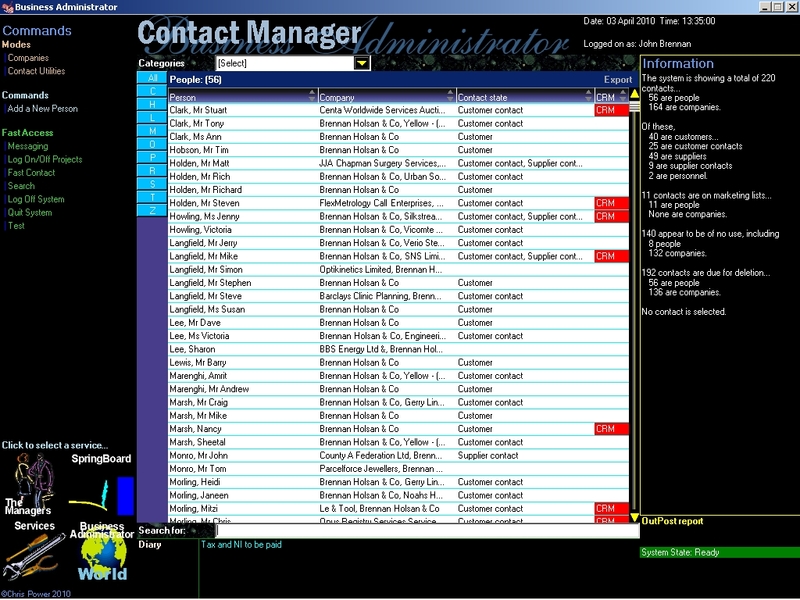 Business Administrator’s interface has long been praised by users for its colourful and functional nature and has now been taken to the next level with a new range of meticulously designed controls. 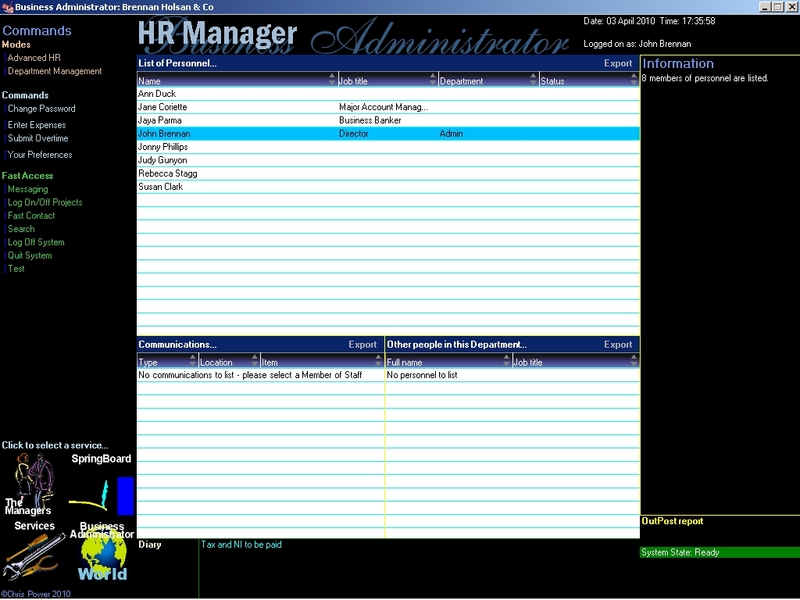 Faster and more powerful than before, the upgraded Business Administrator works in a more natural, intuitive way, with a more organic look. Meanwhile, Business Administrator has become more reliable in its latest edition and is increasingly crash-resistant. A failure in one part of the system doesn’t cause Business Administrator to stop working: the system simply provides a quick message to say that something went wrong and carries on operating without bothering the user with fault reports. The error is then reported automatically to the developers when the package goes online. Because Business Administrator is versionless, the developers can correct the error and re-release immediately. Business Administrator can be a key tool in developing business strategies. 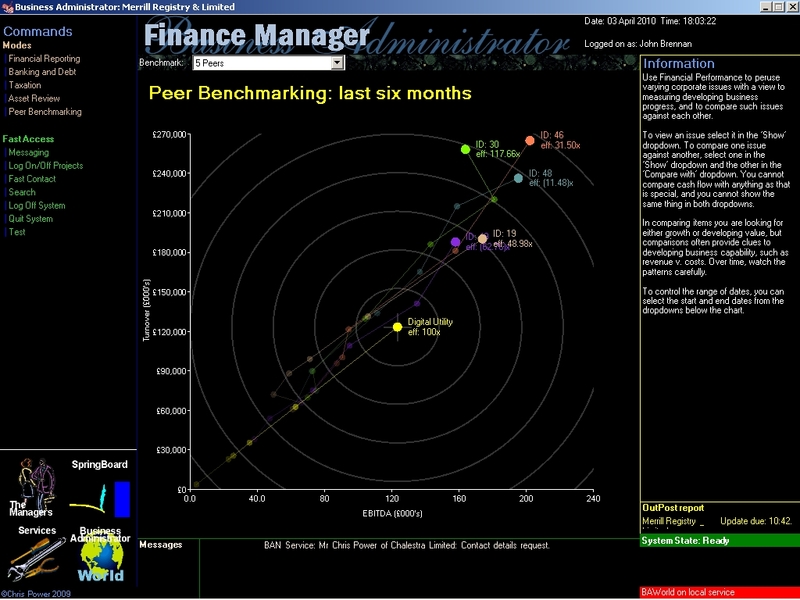 It can analyse changing data and is excellent at measuring and monitoring trends. 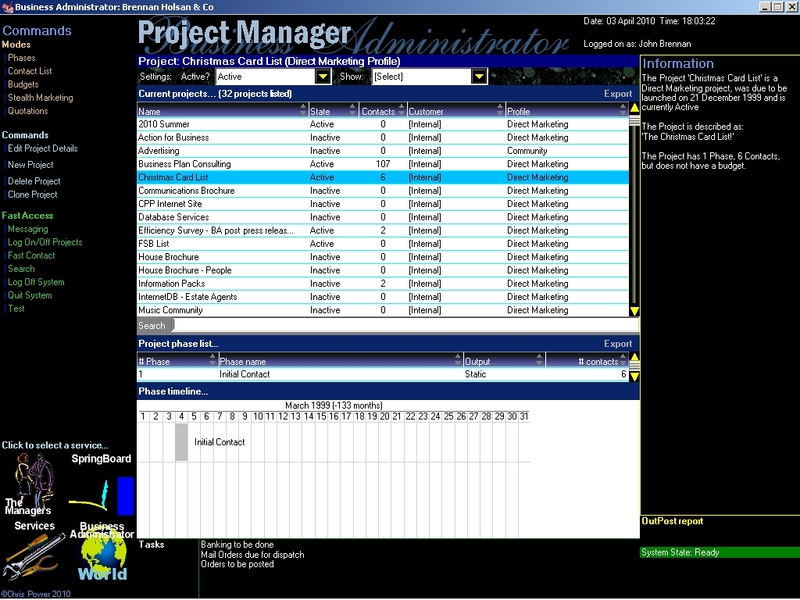 In the latest release, data integrity management has been improved too: Business Administrator now employs a growing armoury of systems to double check data and can ask questions midway through a process to ensure that data is evaluated and checked continuously. In fact, the Q&A system has thousands of questions and it poses them in a way that harvests invaluable input from users without making them feel threatened about their admin skills. Chalestra Ltd is a specialist business relations company and business systems developer located in Middlesex, offering a variety of services to both large and small businesses. Chalestra, alone, has the right to market and sell Business Administrator, and it contributes resources to developing that product. 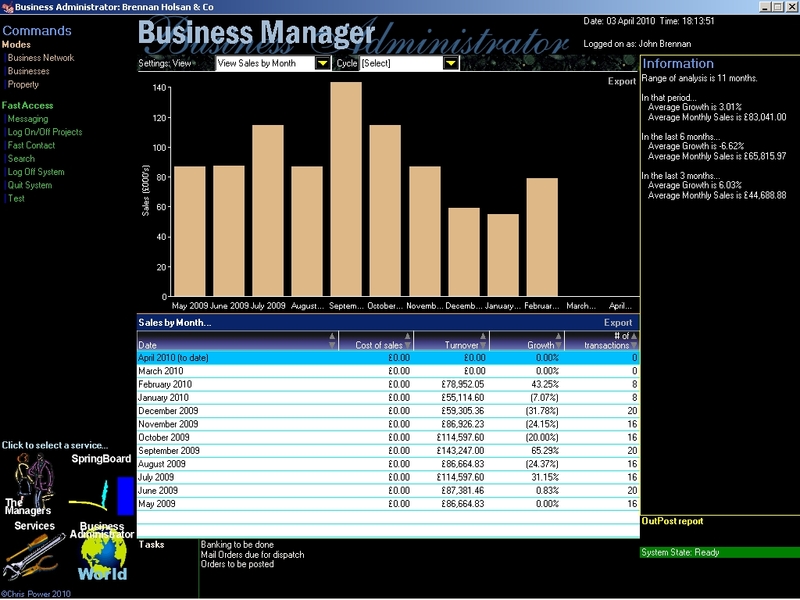 Business Administrator is a highly focused business management system for small and medium businesses. It offers a comprehensive package to simplify the administrative and financial running of a business, dramatically improving business performance with live business reporting services. It is designed to cut down the time it takes to run a business, cutting costs and bureaucracy. 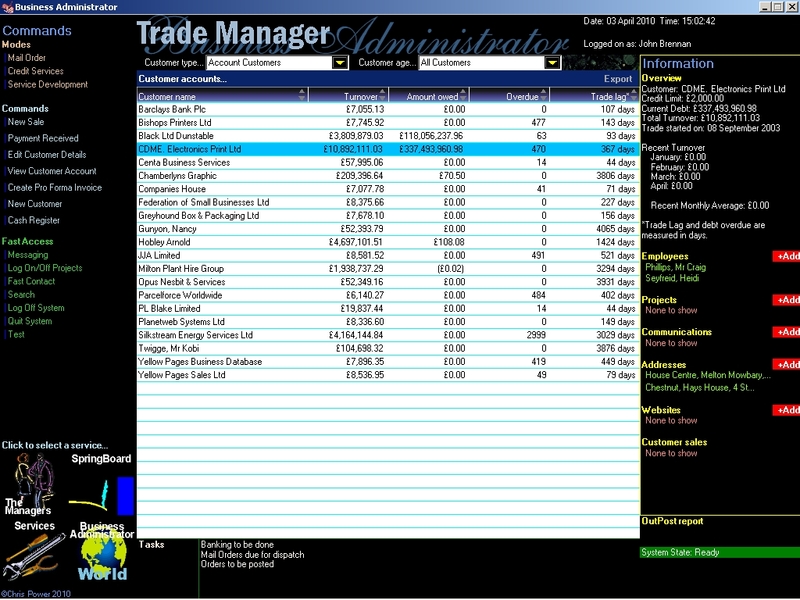 Using Business Administrator is one of the best ways for busy owners, managers and administrators to make the most of their time and cash. 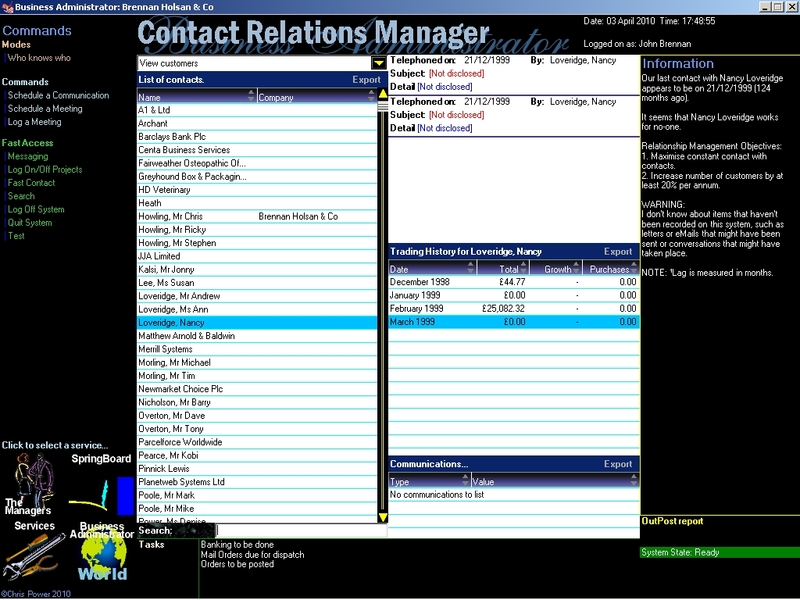 The mini-factsheet offers a quick overview of Business Administrator. 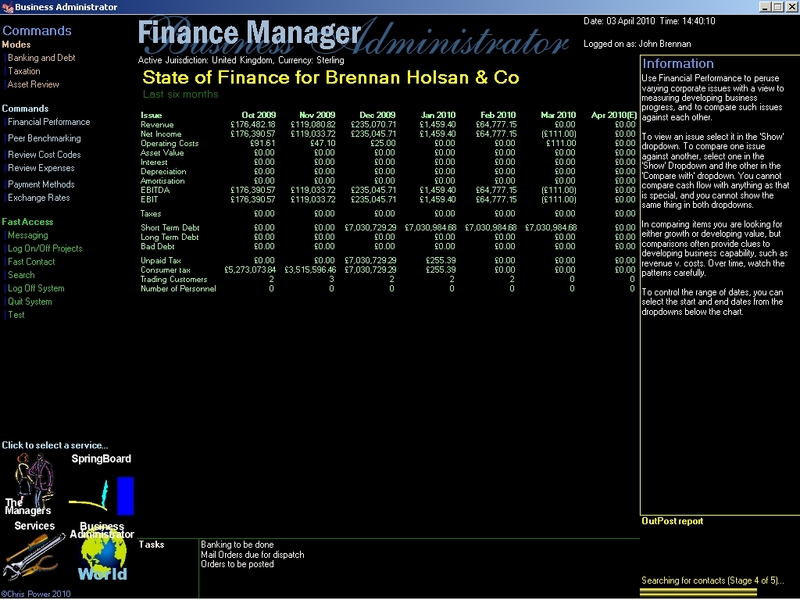 The factsheet offers an overview of Business Administrator in more detail. Our brochure for Business Administrator offers a lot of information about the product.